"The publication date for the NABRE revised is early August. It does have a Concordance"
Didn't exactly answer all my questions, like whether or not the essays and reading guide were updated since the second edition, but at least there is confirmation of a new publication date. Thanks for this update. I had been waiting for this to come out and was wondering if something was wrong. I downloaded the Kindle NABRE instead and I'm reading that in the meantime. How has been your reading of the NABRE OT? Anything stand out? I wonder if they are going to offer the Catholic Study Bible in genuine leather? So far the only listings are for paperback, hardback and bonded leather. With a translation revision this big, there will have to be changes to the commentary notes. Since the reading guide tends to take an overview of important subject matter in larger sections of each book, my guess is that it will remain similar to the last edition. Ok, so I was a little 'brain dead' when I wrote the above comments, of course the commentary notes already did change in the new NABRE and will be in the new Catholic Study Bible by Oxford. Tim, I've been trying to use the NABRE, and there's one thing that stands out to me: the horrendous translation of Isaiah 9:5 remains intact (Wonder-Counselor, God-Hero, Father-Forever). That bothers me more than the birgin/young woman controversy. If you look at the cover displayed on Amazon, it says "Second Edition" on the front: link. Moreover the description of the book on OUP's web site claims it is the "second edition": link. From this I inferred that the study text of the Bible would remain the same, but that the Bible text (and footnotes) would be updated to the NABRE. 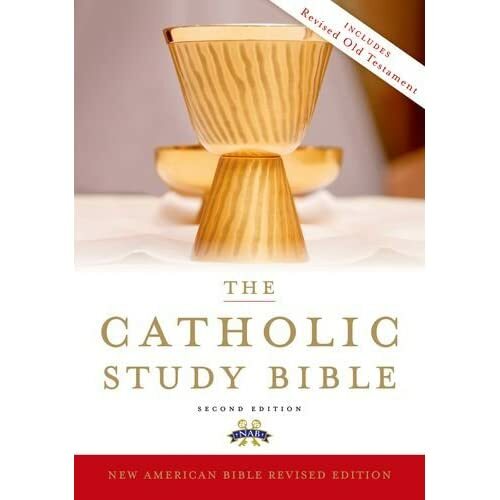 Regarding the question of a genuine leather edition -- when the 2006 edition of the Catholic Study Bible was released, the genuine leather version came out 9 months after the hardcover version. I do not know if a genuine leather version is planned for the 2011 version, but if there is one, I predict it will not show up until the first half of 2012. I haven't had a chance to read the NAB and the NABRE OTs side by side, but the NABRE notes are very interested in in making connections to the Documentary Hypothesis and various Mesopotamian creation myths in the early chapters of Genesis. I thought it was odd that there was no cross reference to Jn 1:1 for Gen 1:1. I'm kind of getting used to the idea of having the notes and cross-references at the end of every chapter. I think ideally that they would be at the bottom of the page, but I don't think that the Kindle can handle that quite yet. One thing I like about the way its set up now is that they form a sort of Chapter review, which makes me go back and re-read the text. I didn't notice this before, but if compare the OUP link that you've got with the the OUP page for the "old" (R)NAB they basically have the same description. It's even still the 2nd Edition. I've been reading the NABRE here and there and have noticed some oddities. Just yesterday I found 2 Kings 21:6 uses "child" instead of "son". I've yet to find another translation that does this, including the Tanakh from JPS. I'll keep reading along.